A financial adviser since 1985, N. Susan Whittington has three decades of experience guiding people toward their financial goals through the ups and downs of the economy. The hallmark of her services is a personalized, comprehensive approach. 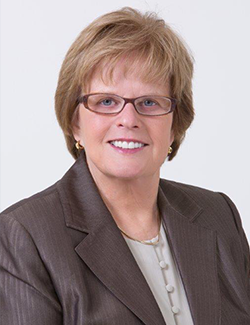 In addition to the in-depth knowledge that comes from experience, Susan brings to clients three master’s degrees: in Education (MEd), Business Administration (MBA) and Financial Services (MSFS). She has also earned four professional certifications: Chartered Life Underwriter (CLU), Chartered Financial Consultant (ChFC), Chartered Advisor for Senior Living (CASL), and Certified in Long Term Care (CLTC). Susan’s extensive experience and training enable her to help retirees and pre-retirees with virtually all their financial concerns. Retirement planning, estate conservation, executive compensation and long-term care strategies are some of her services. A former chair of the Board of Trustees of Wilkes Community College, Susan is active in the community as a Deacon at St. Paul’s Episcopal Church and through a coalition to improve housing and provide housing for the homeless. Her leisure activities include breeding and showing American Saddlebred horses.